Raised in the city, Tom hates having to stay on Aunt Millie’s farm while his parents are away. He misses the buzz of urban life, and loathes climbing trees and walking in fields. 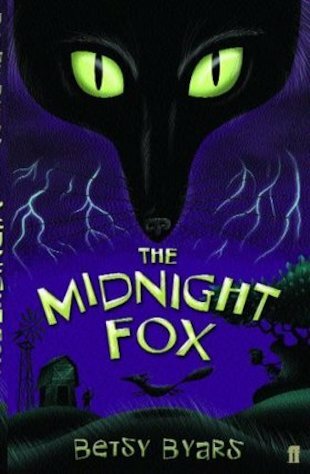 Then one day he discovers a rare black fox with brilliant green eyes, living with her cubs in the forest. Tom is instantly captivated by the rare and beautiful creature, and his summer is suddenly full of excitement. But then Uncle Fred decides to hunt the fox down. Can Tom save the Midnight Fox and her family? Great book!Good for all ages and it makes you npot want to put it down.A breath-taking novel,always keeping me in suspense. I was totally amazed by this book like other people said. But its just great. I was really surprised by this book – in a really good way! I love Betsy Byars, and this once will remain a favourite of mine. The plot was fast and brilliant, and the characters too! An all-round great story! Betsy Byars’ awards include the 1971 Newbery Medal for Summer of the Swans.